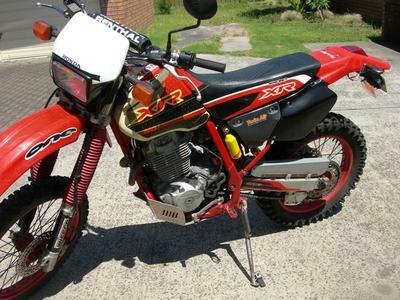 The 1996 Honda XR400 Dirt Bike for Sale is in great used condition and has lots of extras that those of you just entering the world of off-road, trail riding will love. The Honda XR series dirt bikes have air-cooled single-cylinder four-stroke engines and are a blast to ride! The bike comes with a a 3 rail motorcycle trailer. If you have any questions regarding the Honda or the dirt bike's trailer or if you would like to make an appointment to see it in person or make payment and pick up you can do so using the space below that has been provided by GoGoCycles Used Motorcycle Classifieds and PLEASE do not neglect to include your contact information in your email or to provide a phone number or email address so that I can respond with answers to your questions or set up an appointment as quickly as possible. In my opinion there is not a better deal on a used dirt bike for sale as this motorcycle on Craigslist or in an Ebay auction so hurry and make an offer so you can start your off-road riding adventures before it gets away from you! GoGoCycles would also encourage our biker friends to write a review of the 1996 Honda XR400 Dirt Bike for Sale or share any thoughts and/or opinions to make potential buyers aware of any problems that are commonly associated with the XR's or to highlight their positive features and help our visitors make informed decisions. To get my asking price you can email me and don't forget to mention that you found this ad on GoGoCycles Motorcycle Classifieds www.gogocycles.com using the comments forms located on this page. How many hours does it have on it and what's your best price and location?